The following shows the specifications when it was sold on the 30th of September 2018. 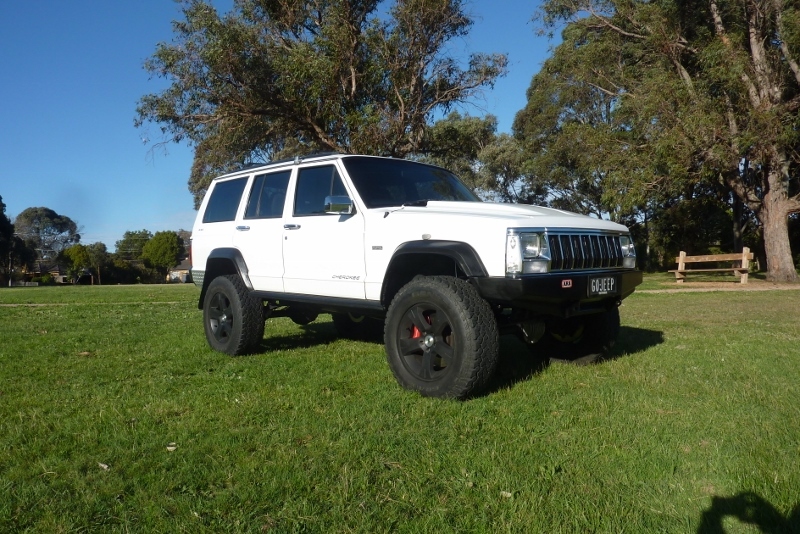 This unique Jeep became known world wide due to this dedicated website on its build showing many of the modifications performed on this vehicle. It has also has appeared in magazines both here and in the USA. Years of research and development has gone into creating it. All well thought out to work in harmony with its intended purpose of touring Australia and being reliable doing so. For example: Taller tyres are matched with the right diff ratio and bigger brakes front and rear so better than factory combination performance. 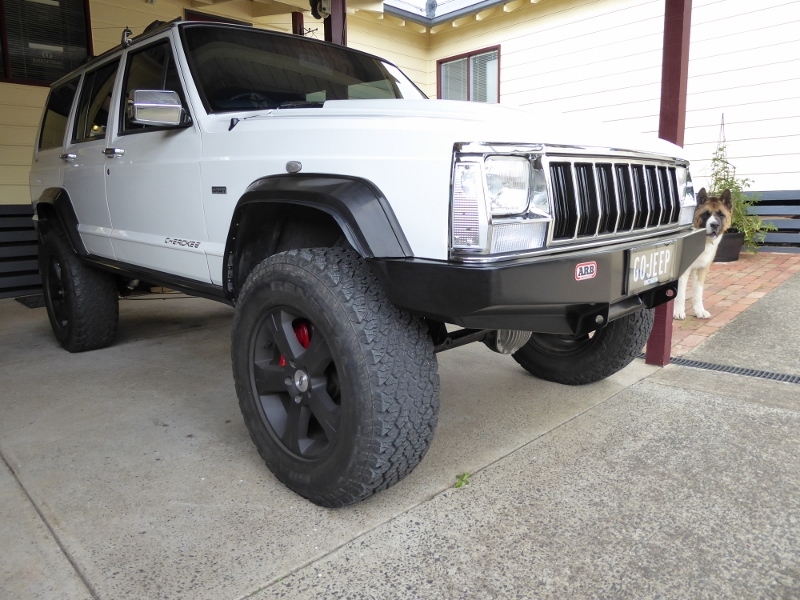 4” lift has all the steering links raised to keep factory angles along with dropped front suspension frame link brackets to keep the same geometry along with swaybar links extended. 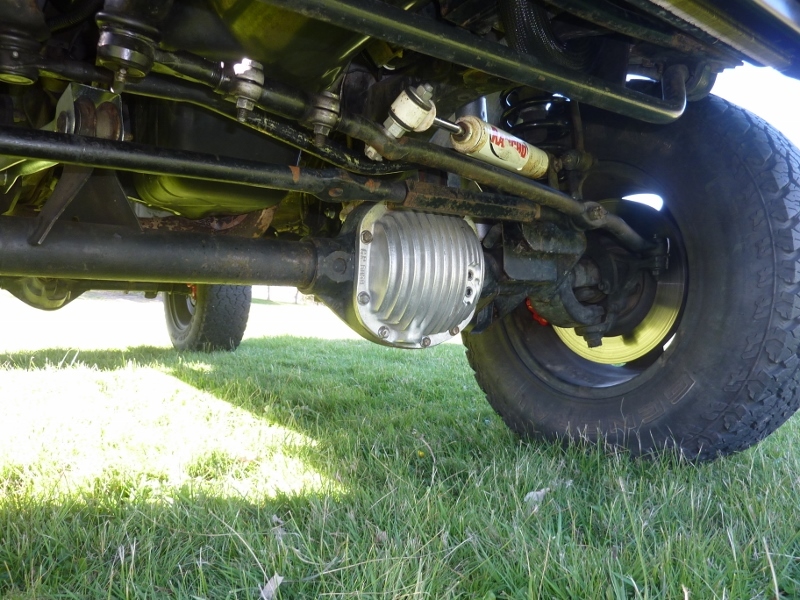 Adjustable front panhard bar fitted to centre axle after lift. Rear driveshaft has had a slip yoke eliminator so a longer driveshaft with a double cardan joint can be fitted to reduce the uni joint angles. 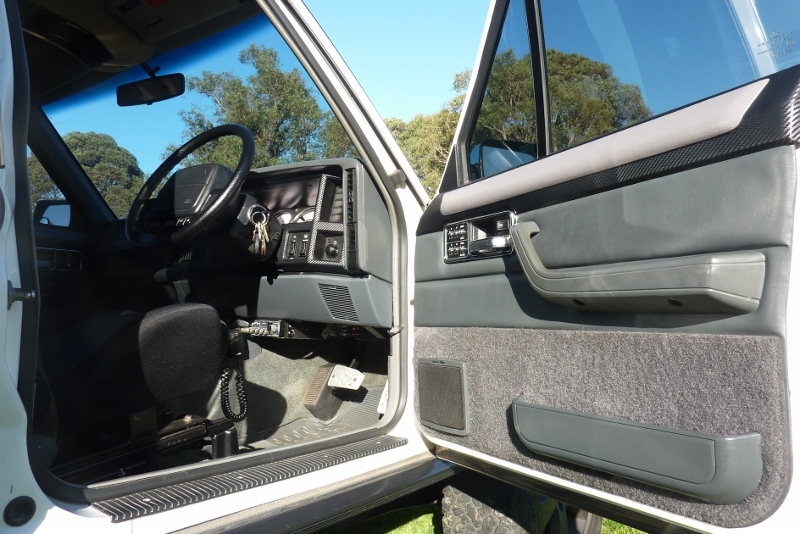 Chrome Laredo/Wagoneer mirrors, door handles and drip rails. Windows all have a titanium tint. No bubbles and fading and 99% UV and 60% heat protection. Front and rear arches trimmed to clear the 32" tall tyres. Also discrete rubber flare extension to cover tyres along with moulded mudflaps brought back from the USA. Reflexion all steel 2" induction bonnet. Very rare as only limited number made. 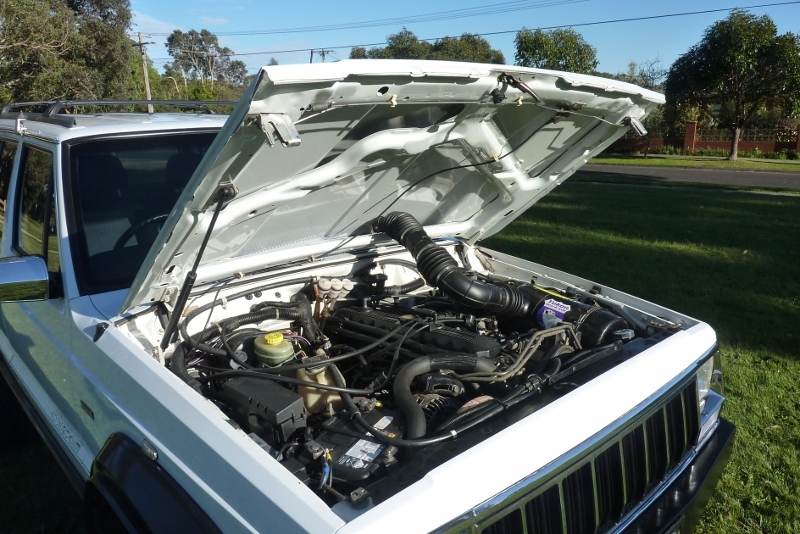 Let hot engine bay air out at low speeds and cool air in at highway speeds. 145/100 headlights with 4 relays and high amp/large gauge wiring loom. Rubber door sill moulding to deflect stones away from body work. Rear height fully adjustable with airbags to level ride for different loads. Rear door modified to swing open further than stock. 13.5" Ford Territory Turbo with 4 piston Jeep/Chrysler SRT Brembo calipers. 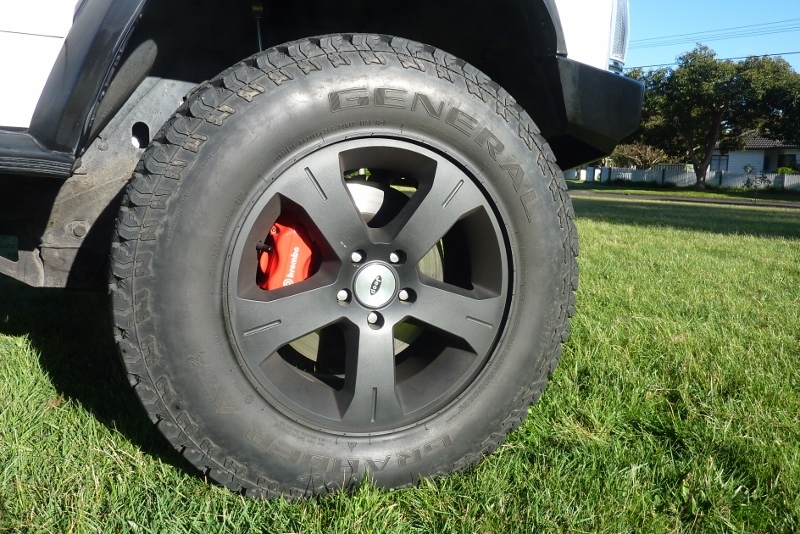 Plasti Dip coated wheels with can be peeled off and returned to the polished alloy finish underneath. Taurus 2 speed selectable fan conversion with manual over ride. Stock electric fan still fitted with copper and brass Adrad radiator. No cooling issues at all. Custom battery tray to fit larger battery. MF80D26R with 720 CCR and 130RC. 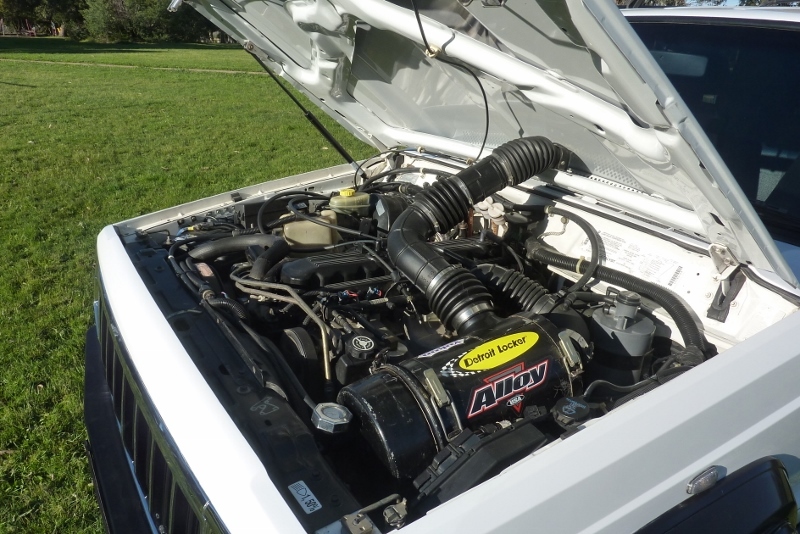 A 132 amp high output alternator from a V8 Grand Cherokee. Diffs, distributor cap and transmission vents at the top of the firewall. Gas strut bonnet support conversion. ZJ all disc brake proportioning valve fitted to suit disc brake conversion. Cold air is pulled through the cowl induction opening of the bonnet into a cyclone type air cleaner. Power steering cooler and much larger auto cooler fitted. Adjustable fuel pressure regulator with higher pressure fuel injectors. Stainless steel long tube headers and stainless 2 3/8" fully exhaust including cat and mufflers. Later model intake fitted along with heat shielding and bored throttle body. Full sized 32" wheel tyre fitted inside. Wheel and tyre match the rest exactly. Subwoofer, tool less quick removal when space is needed, and amp also included. Ford Territory rear disc brake conversion with 13" rotors. 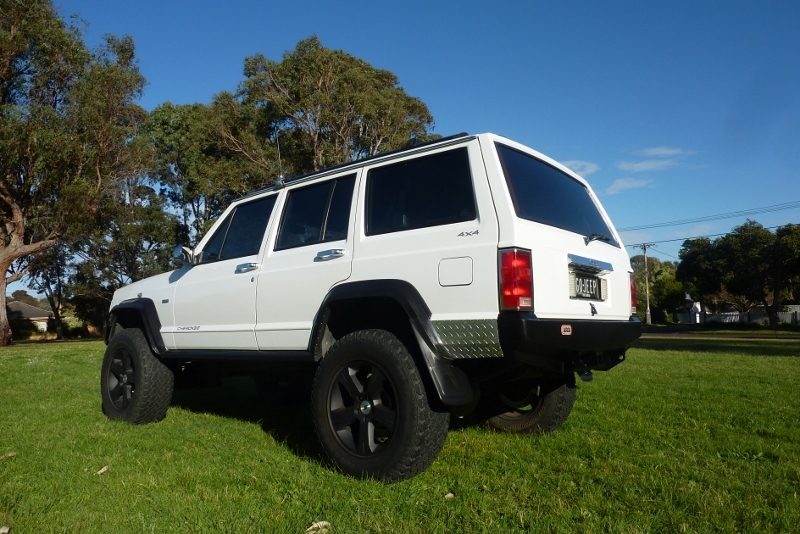 OME/ARB rear leaf springs were recently added. CS034RA/OMECJ1A on the right and CS034RB/OMECJ1B left. Same spring rate but the right has more camber to carry the weight of the spare. Driveshaft was made in the USA and has a double cardan upper joint, CV, along with a SYE, slip yoke eliminator conversion. USA made front shaft as well with double cardan joint. Braided and fully ADR approved brake line is longer to match increased travel over stock. Bigger and stronger than TJ D44, and much stronger than stock D35 rear axle. 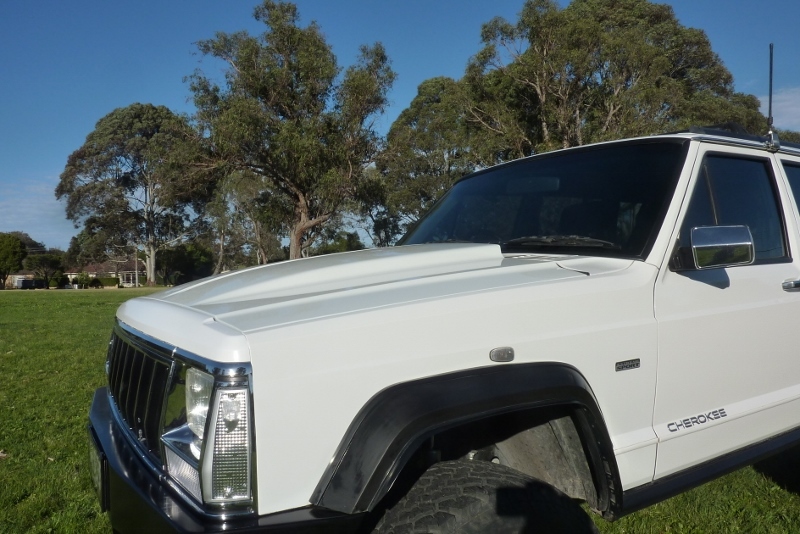 Was NOS MJ/XJ axle I imported from the US. 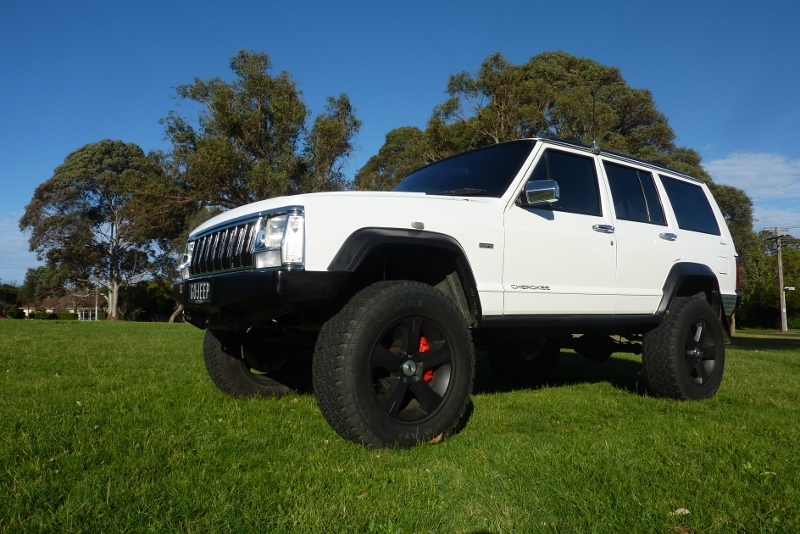 Fitted with 4.56 Yukon gears, Detroit Locker and CrMo US Alloy axles! Rear lower mounts raised 2" and fitted with RS999194 9 way adjustable Rancho shocks with custom alloy stone shields. Forged USA made diff cover. Fuel tank capacity increased to 90 litres from stock 76. Low mileage since all shock absorbers changed, RS999118 9 way adjustable Rancho shocks with pin eye conversion. ARB 934 ZJ V8 OME coils with 2" spacers. Fully ADR approved braided brake lines are longer to match increased travel over stock and to fit the Brembo 4 piston calipers. WJ lower control arms fitted which are stronger and have bigger bushes for better NVH. All frame control arm mounts lowered to bring arms back to stock angles and further improve ride comfort. USA made forged alloy diff cover with 4.56 Yukon gears and Detroit Trutrac diff. 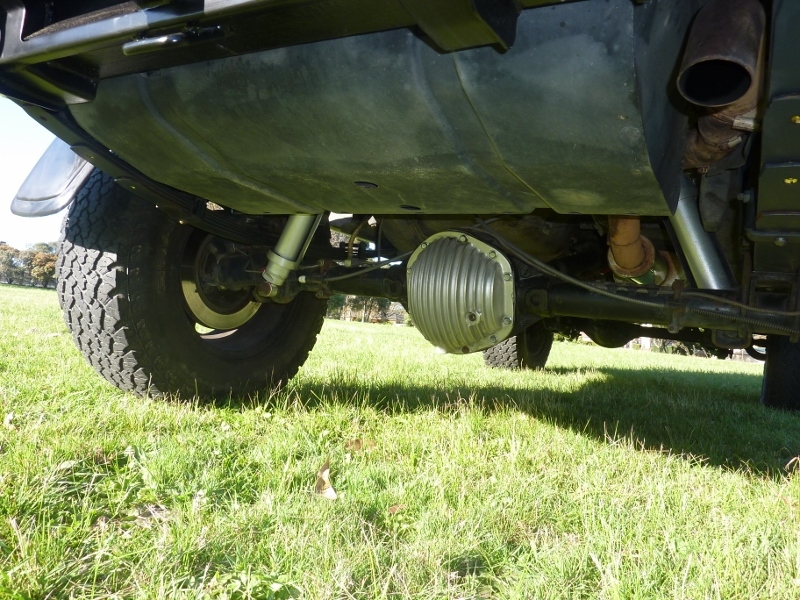 Over the knuckle tie rod conversion with raises the tie rods to bring back factory angles. 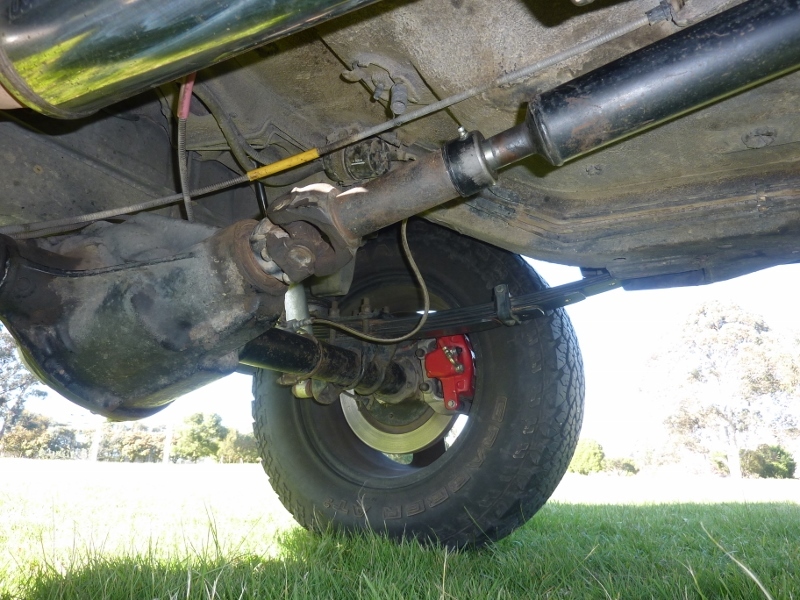 Solid tie rod, drag link and adjustable panhard rod. Panhard was also raised to match the height and angle of the drag link to factory specs. Bigger tie rods fitted. Extra steering box cross brace fitted to prevent tearing of the inner frame. Factory recall on frame mount strengthening was also completed before any problems. 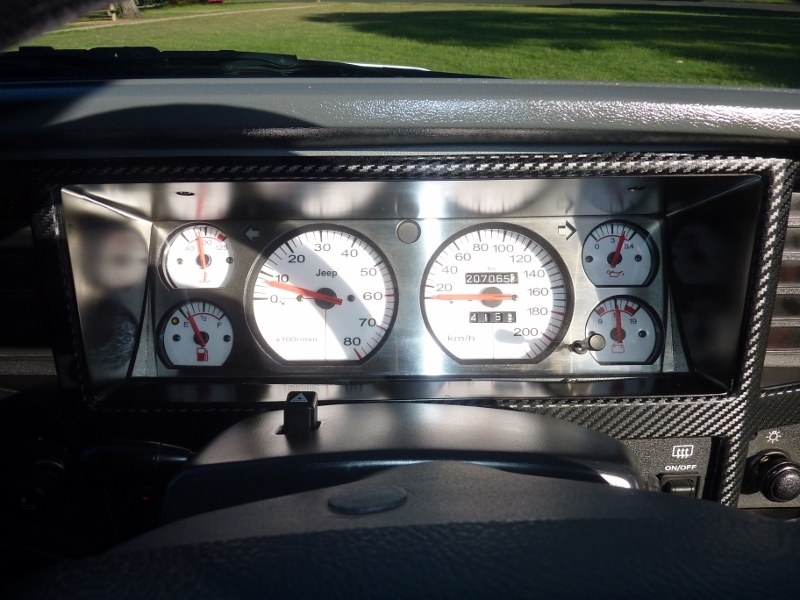 Stainless steel overlay on the gauges. Also I made a one off custom white background different to the others I sell. Can see only 207,065 km travelled. Dash and door trim covered in a carbon film. 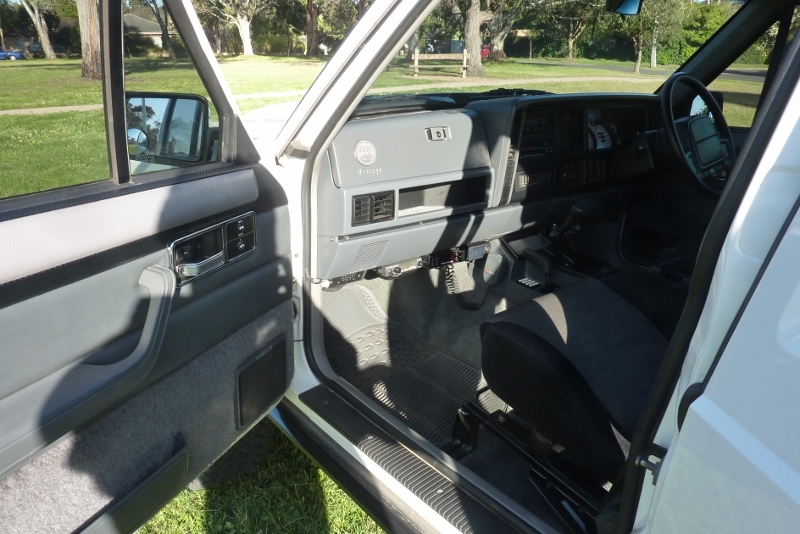 Door panels are from a Limited version that has the leather interior. Noticed the US only chrome door handle and electric window switches. Door hinges have extra welding to stop them breaking from the A pillar. This was done BEFORE it started to happen. No cracking or fading on the dash pad, glove box lid etc at all. GME UHF CB and PC122 AM CB included. Hidden aerial cabling up to gutter mounts. 27 full function trip computer showing distance to empty, litres remaining, litres per 100km based on average or current etc. 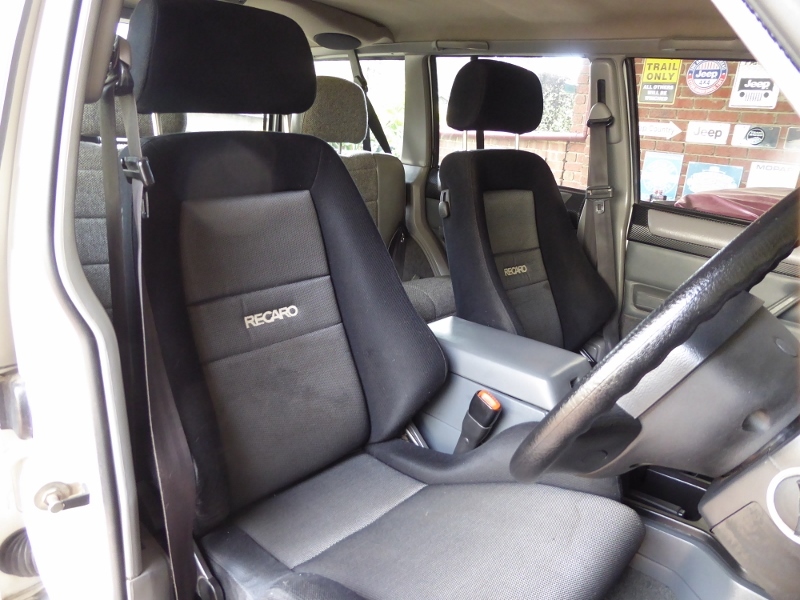 Very comfortable Recaro seats adapted to be bolted to the XJ seat runners and floor mounts. From a Mitsubishi Lancer EVO IV. Optional factory fitted cruise control. Custom rear bar made from a 80 series front bullbar. NOS Wagoneer taillights and chrome trim above the number plate imported from the USA. LED reverse lamps and number plate lights. Propeller plate corner guards. 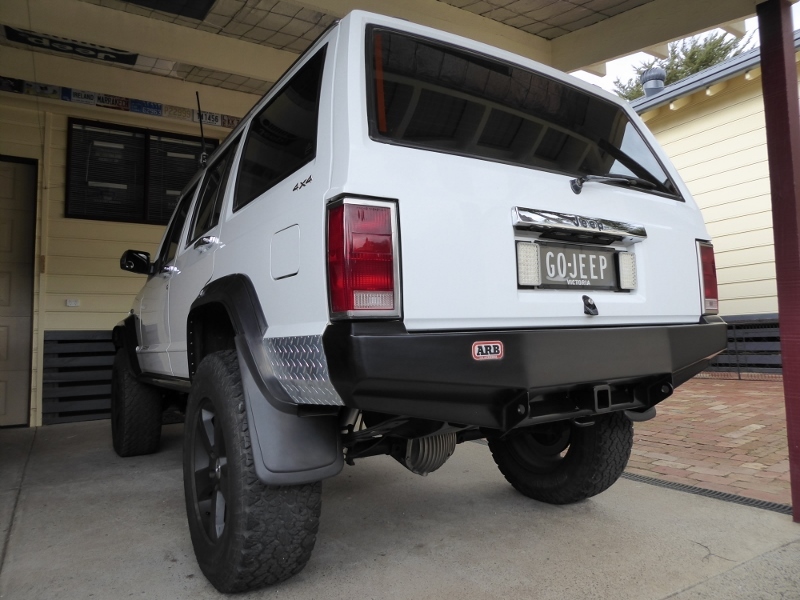 Front ARB bumper also from a 80 series Land Cruiser cut down and modified to suit. Hide a full Hayman Reese towbar and bottom is vented to direct more airflow over the coolers. Clear indicators with LED globes that flash amber once lit. Corner lights also clear and wired as parkers. Clear side indicators as well. 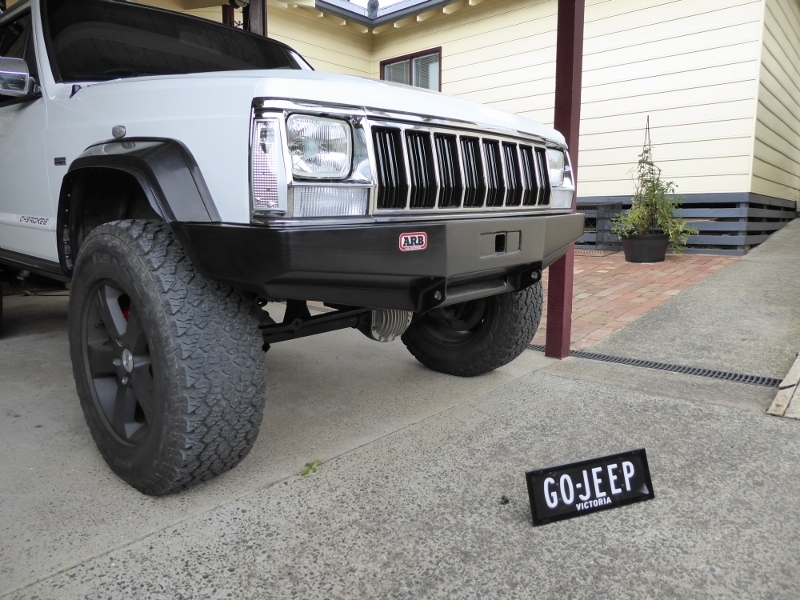 Number plate mount will be included with the sale, but personalised GOJEEP plates are not. Below are just some of the features recorded on this website so you can see more details. 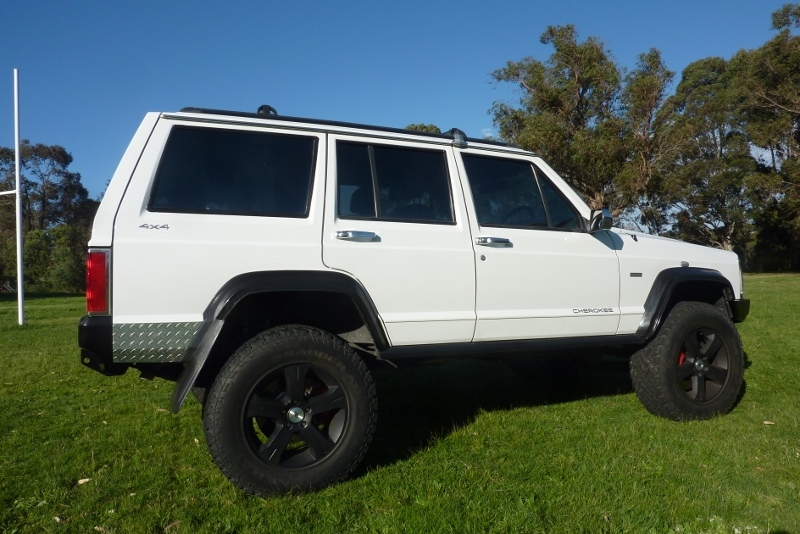 The Jeep when it was featured in 4WD Monthly/Action. Shows some of the modifications added to the exterior. Adjustable Fuel Pressure Regulator and updated injectors fitted. Covers the airbags that are fitted to the rear. 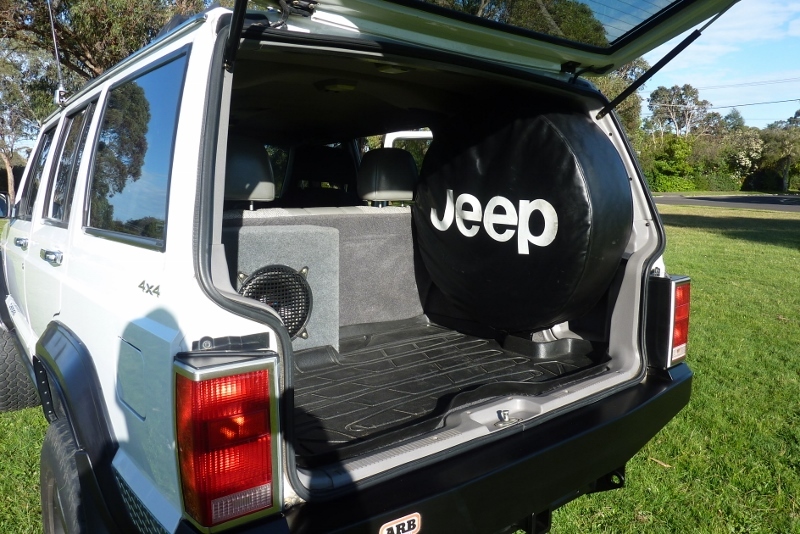 The air filter system setup for Outback touring. Construction of the front bumper with built-in Hayman Reese fitting. Auto cooler upgrade for towing. One of a kind deep sump for the transmission. Balancing beads so you never have to balance your tyres again as they wear. Replacement of the auto belt tensioner. 4 piston SRT Brembo front calipers with 13.5” rotors. Special cowl bonnet to control engine bay heat. No longer made. Axle breather extensions for river crossings. UHF and AM CB’s are included. Much sought after D44 rear axle upgrade, 4.56 ratio, Detroit Locker, CrMo axles. Dash and door trims covered with a carbon print film. Dash clock from a US model. Front and rear forged alloy diff covers with drain plugs. Front wheel well trimming to clear 32” tyres. Front guard trimming like updated models. Fuel tank mods to get 90 litres capacity. Wiring and relay upgrade for higher wattage headlights. Later model intake for more hp. Intake shielding to keep temperatures lower. US model chrome mirror housing. Over the knuckle steering conversion. Over the knuckle swaybar brackets. Over the knuckle Panhard bar mount. Overhead console fitted. Temp and direction display has recently stopped working. Restrictor to increase coolant pressure and slow flow for better heat transfer. Copper and brass Adrad radiator fitted. Trimming rear arches for 32” tyre clearance. Rear door check straps modified to increase opening swing. Front axle link drop brackets to correct angles after lift. LED reversing lights currently fitted are at the bottom of this page. Slightly longer and much stiffer rear shackles. Shifter and transfer case handles changed. Shields to protect shocks from stone damage. Full sized 32” tall spare tyre carried inside. No swing-a-way to open every time! Steering box brace to remove mount fatigue and movement. 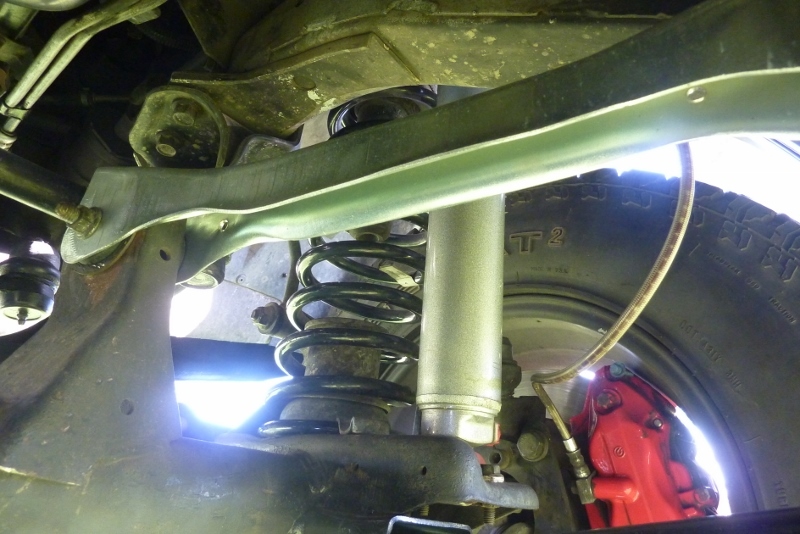 Extended swaybar links to match lift height change. Slip yoke eliminator fitted to improve rear driveshaft uni angles. XJ Wagoneer taillights from the USA fitted. Mechanical clutch fan replaced with 2 speed selectable high CFM electric fan. Throttle body bored for more throttle response and less restriction. 328mm Ford Territory rear disc brake conversion fitted to replace drum brakes. Stronger solid tie rod upgrade to replace weak factory hollow one. Trip computer with distance to empty and fuel economy etc fitted. Custom white instrument background made and fitted. WJ lower control arms with greater strength and NVH absorption bushes. ZJ brake proportioning valve to balance rear disc brake conversion.